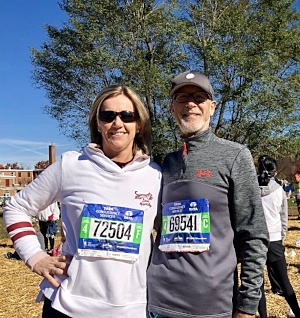 On Nov 4th, Andrea and I completed the New York City Marathon. From the 34 km mark, I was repeatedly reminded by my body that I was running further than I had ever run before in my life; at nearly 63, with active but controlled rheumatoid arthritis. What was I thinking?! The whole journey was an amazing experience of vision, commitment, perseverance and community, and I couldn’t have done it without you. Being surrounded by a courageous group of people who have committed to changing their lives for the better is totally inspiring! Andrea and I have had different journeys there, so I will tell you about mine, and Andrea can add in her learnings at the end. Throughout my life, I was never the sporty type. I would have occasional bursts of trying to get fit like we all do, but they never lasted. Then, at 52 I was struck down overnight with rheumatoid arthritis. It felt like I had aged 20 years, and I started a life of pain which never really resolved. The initial medications didn’t work at all, and I thought my life was over. I changed doctors, got started on good medication, and slowly got back to some activity, and eventually could lead an almost normal life, but still didn’t do much more than play Tuesday night tennis. I blamed the arthritis, but actually I was just lazy. Then came one of those Aha! moments that alters your life. We were having one of our Thursday afternoon WLS meetings where we discuss the new patients we see and any issues with others who are post-op. Our counsellor said: “If you are not doing self care [that you can do], then you are doing self harm [as surely as cutting yourself]”. And I realised that for me, the greatest risk was a heart attack brought on by my chronic inflammatory condition, and the easiest self care was just doing more exercise. Here I was telling everyone else what to do, and not doing it myself. I hate being caught out as a hypocrite, so I went home and started with just 5 mins on a cross trainer. Then 7 minutes the next day. And slowly built up to running 5 whole kilometres! That was further than I had ever run in my life! That would be enough, I thought... but then Andrea, who was also wanting to get fit, got excited by the idea of running the Disney Half Marathon in Orlando. “Won’t it be fun, running with Goofy!” she said. I thought she already was, knowing how awkwardly I ran :) However, there’s no stopping her when she gets going, as you all know, so the distances got longer, right up to 13 km! Then it was off to Disneyworld, to do the night half marathon. That was another experience of my getting to 13 km and then knowing that every step after was further than I had ever run in my life before. Amazing what being married to someone 12 years younger than you makes you do out of fear of being left behind. Despite that fear, she did leave me behind. After 16 km I started the thinking “ You’ve done ok. You could walk from here...”. But that’s when I thought of all the weight loss surgery patients I had encouraged to stick to their goals through the tough times, and had the “Hypocrite!” self talk going, so decided to run all the way, inspired by my amazing patients! And I achieved it, thanks to being involved with you guys. Fast forward through two more Andrea inspired half-marathons (Andrea gifted me an entry to the Queenstown Half as my 60th birthday present, but thought we could practice by doing the Melbourne Half first!). Mid last year, I was sitting in the Southern Cross Hospital tearoom where a group of nurses were talking about the thrill of doing the New York Marathon. They were discussing how they were planning their training and that a number of surgeons my age were going to do it, and that’s when major FOMO kicked in! (That’s fear of missing out for those of you my age...). Knowing my tendency to get all excited about things and then let them slide, I rapidly booked in through the Marathon Tours group and paid a substantial deposit to ‘make’ myself go through with it. Then I started telling everyone I was going to do it to add to the accountability. And I started running and comparing my distances and times with the other (younger and fitter) members of the group, and realised that I might be just a little bit competitive.... perhaps a really little bit. And surprisingly, for the first time in my life I actually stuck to a training programme- well mostly, if it wasn’t raining and I felt like it. But it was enough to get me to doing long boring runs, listening to many non-boring TED talks, exploring “roads” around Ohakune that had sheep grazing on them, and seeing magnificent views of the mountain. And I managed to inspire some of you on the Retreat to run part way down the mountain with me, and see the look of achievement in your faces as you pushed through your limits too. But despite all the training, it never got easier. I struggled. I would arrive back at the retreat pale and exhausted, and they were all worried I was going to kill myself trying to live longer! But I made it to my goal of 34 km, and was so relieved to be tapering, i.e. only doing 21 km the last weekend before we left. But I had no confidence that I could finish, despite all the training. The last 20 km run I did was so hard. It all felt like an exercise in futility. But I knew I had already accomplished more in my old age than I ever thought possible, so flew over to New York accepting that I would do the best I could. The nurses, surgeons and us all went off to collect our running bibs (numbers and tracking label, not because we dribble whilst running!) and entered a huge hall full of athletic looking people from all over the world. The excitement was energising, the atmosphere full of expectation and challenge. And there were even one or two who even looked older than me! The day of the marathon we were up at 5 am for breakfast, knowing we wouldn’t be starting until 11am. Then onto the bus to the starting point on Staten Island. The sun rose as we got off the bus and made our way to a grassy area to sit and wait. Nerves, bagels and queues for the Port-a-loos. Dunkin donut beanies. Our friend and colleague wrapping her toes in cotton wool. Nervous energy rising. Then Time! Into the shearing chutes - sorry, starting corrals. 5,4,3,2,1- boom! And we’re off... trailing slowly towards the start line with 4,000 other people, until we get onto the Staten Island bridge, and we can start to jog. And as the crowd thins, we can even start to run. Because we are on a bridge, then a motorway, all we do is run and avoid walkers, trying to keep to pace, but feeling good. I know Andrea is three corrals behind, so starting soon. And then we hit the streets of Brooklyn and the people of New York City, lining the streets, cheering us on, bands, signs and endless high 5’s! Noise, excitement, ENERGY!! And a growing confidence that with all this support, I could make it? Then just down to the work of doing the distance. But whenever I felt I was flagging, I ducked to the side and high-fived a dozen strangers, and actually felt an energy boost. And after 34 km I was back to the old familiar “You are running further than you have ever run in your life before! You’re mad! You could walk now. No-one would care..”. That’s when I pulled in all the images of you incredible people that had fought the battle and won! The hugs of gratitude, the delight at running down the mountain, the faith you had put in me to help you, all the positivity you guys had, the persistence when it got hard... I tapped into all that and kept going. I’m convinced that the last 2 miles are much longer, and that they are just toying with us. But finally the finish line was there, and I was surrounded by weeping, excited, happy, exhausted, smelly people who had done what they said they would. And I was one of them! Thank you! As David has mentioned in his blog post here, we both completed the NYC Marathon earlier this month. In direct contrast to David, I ran this marathon with virtually no training, and not only did I finish it in a reasonable time frame, I actually enjoyed it as well. To give you a bit of background history, I had always intended on running this race with David when he entered us in it 18 months ago. Unfortunately, due to being plagued with an ongoing knee issue, I had to give up running any sort of long distances as the pain in my knees was becoming increasingly unbearable and was preventing me from doing many of my basic physical activities, like walking up and down stairs! As a result, I went off to New York with David, with zero intention of participating in the Marathon, and subsequently didn’t even bother to take my training running shoes with me. Sitting in the lounge at the airport was when things changed. I was encouraged, strongly I might add, by a colleague friend of David’s to at least ‘walk’ some of the course…after all, you can’t go to New York and not attempt to walk some of it. I agreed that it was worth a shot. I knew I could walk on flat ground for a fair distance and figured 21 km in no set time frame was possibly do-able. I figured if I took my subway pass, and some money, I could easily leave the course when I felt like it, catch the train and meet David at the finish line. Anyway, I started the marathon with the wife of a colleague whose goal was to complete it in under 6 hours. She was planning to walk/run what she could, and we agreed we could keep each other company for as long as we wanted to. We ran and we walked in 2 minute cycles into the Brooklyn borough. My knees didn't hurt, the sun was shining, my head was in a good space and I was revelling in the support, motivation and ongoing cheering from the crowd on the streets. Demonstrate to yourself that you CAN do what you believe you can do. Prove it to yourself, and that nothing will stop you. Push yourself outside of your comfort zone. Tell yourself it’s impossible. Nothing’s impossible..Only you decide what your limits are! A couple of weeks ago at the January retreat, Andrea mentioned that she had entered two WLS teams into a small triathlon the next weekend, but sadly the person who was doing the bike leg for one of the teams had just pulled out. Andrea was clearly disappointed. Before engaging my brain I asked how far was the ride? She said 6-7km and it will be flat (she lied). So before I had time to engage my brain and ask questions, I opened my mouth and said I would do the bike ride… Doh! Join the Weight Loss Surgery team as we take on the Tongariro Crossing, 1st April 2017. With a varying degree of terrain and the infamous Devil's Staircase, this outing also offers stunning views along of one of New Zealand's most iconic outdoor adventure tracks.